20 percent of the planet thinks they are the 80 percent majority. 20 percent of the planet make the rules, which do NOT apply to 80 percent of the planet. If you remember this first, this will help your common sense to function properly. Ask yourself am I the 20 percent or the 80 percent area of the planet? 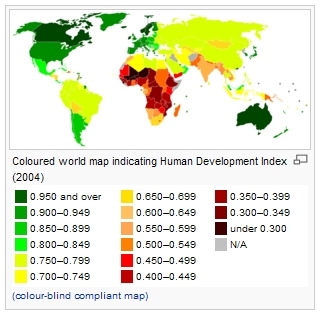 This is a map of the Human Development Index, and trust me, Mexico, Argentina and Chile are part of the 80 percent. What I can buy in on 20 percent of the planet, I cannot buy in the other 80 percent of the planet. What I can buy on 80 percent of the planet, I cannot buy on the other 20 percent. What is needed on 20 percent of the planet is not needed on 80 percent of the planet. Moreover, what the 80 percent need is not necessary for the 20 percent. What you can do on 80 percent of the planet you cannot do in the 80 percent. Drive a car on 80 percent of the planet, you will learn, the rules are not the same. I receive all sorts of silly well-intended advice from 20 percent of the planet; some of the best is to go to Home Depot and buy something, or to order a book from Amazon.com. The Europeans like to think 80 percent of the planet agrees with their opinions of the USA, and this is crazy. If you can buy it easy in Asia or South America, you probably cannot buy it in Europe or the USA and the converse. In some ways, you can apply the 20-80 percent rules to any country, what I can buy in the biggest city in the country, the 20 percent; I cannot buy in the other 80 percent. Map with the a better color perspective, please also try to count the number of people, not just land mass, Canada and Australia are big countries with very few people.